(WBXX-TV), and at 12:30 p.m. on MYTV (MyVLT-TV). 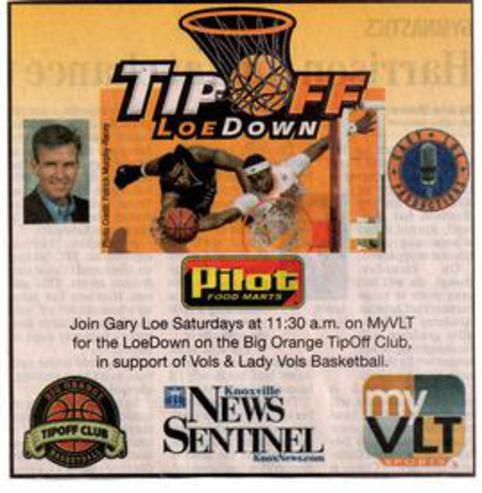 The Big Orange TipOff Club in conjunction with Gary Loe Productions offers viewers inside access with TipOff LoeDown to NCAA basketball’s biggest names, who share stories over lunch that they’d never tell the media. Each week you’ll experience the camaraderie of UT Vols & Lady Vols basketball fans, while hearing off the cuff remarks and behind the scenes adventures from nationally known keynote speakers. Speakers have included Tennessee head coaches Rick Barnes; Holly Warlick; Counzo Martin; Bruce Pearl; and previsouly the late Pat Summitt; CBS.com basketball writer Gary Parrish; former Georgia coach Hugh Durham; former Vol player Mike Jackson; voice of the Lady Vols Mickey Dearstone; and former Maryland coach Lefty Dreisell. Also, former Auburn coach Sonny Smith; Yahoo Sports writer Pat Forde; former Vol Academic All-American Lang Wiseman; and Lady Vol Sullivan Award winner Chamique Holdsclaw. TipOff LoeDown captures the essence of these well-traveled players and coaches who’ve ridden the team bus, and who will share the basketball lives they’ve led on the court, along the sidelines, and in the locker room. This half-hour sports television show can be seen in-season on Saturday mornings at 11:30 a.m. the CW20 (WBXX-TV) and at 12:30 p.m.on MYTV (MyVLT-TV). The LoeDown continues in production with its 13th year for the 2018-2019 NCAA basketball season. Please contact Gary Loe for more information at (865)584-5842 or garyloeproductions.com.